This will be our last release of the plugin for the flash/flex-based vSphere Web Client. All new features and versions will be solely for the HTML-5 interface after this release. Look for HTML-5 support releases to begin in 2018. We no longer support vCenter 5.1. We actually block install of the plugin to 5.1 environments in the GUI installer. You do not need to upgrade to Purity 5.0 to use/or get the 3.0 plugin. Support can load it onto an array running older Purity if you prefer. To install/upgrade, log into you FlashArray GUI and go to the settings panel and then software. Then choose vSphere Plugin to connect to a vCenter. If you want to install it to more than one vCenter, just simply disconnect and reconnect to another vCenter. And repeat as needed. There are quite a few new features/enhancements. 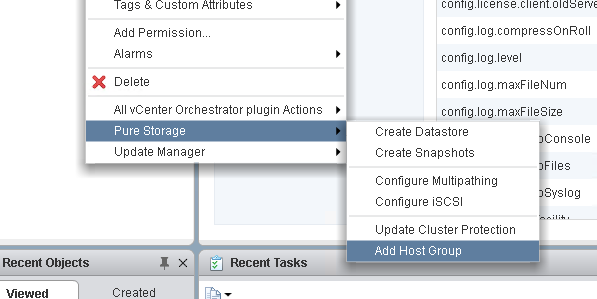 Now when you right-click on a host or cluster the Create new Datastore wizard will have the VMFS-6 option. This requires the host you clicked on to be 6.5, or the cluster to have ESXi 6.5 hosts. 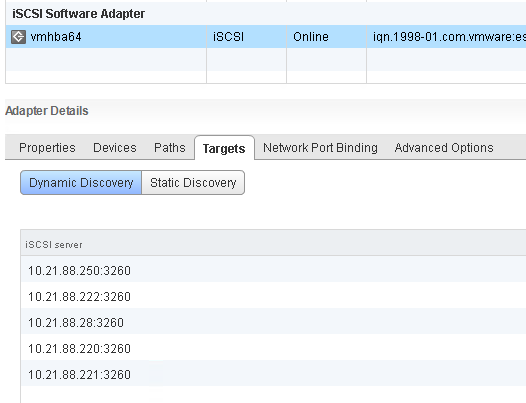 Another new feature is iSCSI configuration. This exists in two places, either when you are creating a new host group or by itself. Creates a software iSCSI adapter if it does not exist on the target host. If the adapter already exists, it skips that step. If the target already exists, it skips that step. If the best practices are already set it skips it. So if you preconfigured something, the process will not fail–it will simply move on. This feature can be used when creating a new host group. 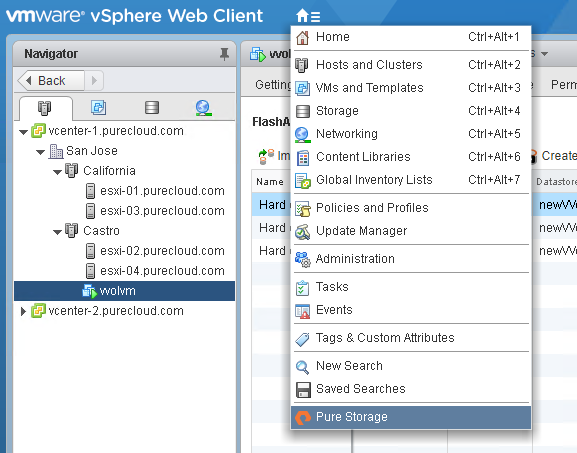 So right-click on a vCenter cluster, choose Pure Storage, then Add Host Group. 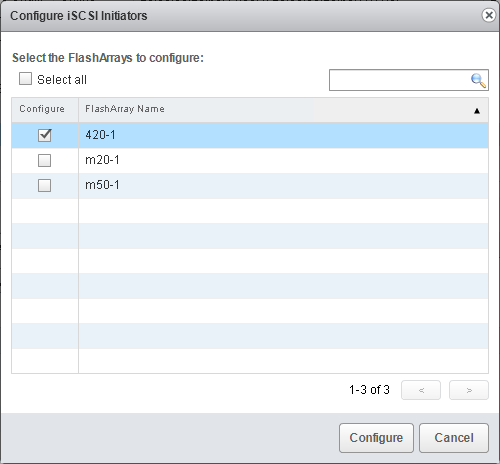 Choose a FlashArray, then iSCSI and keep the option “Configure iSCSI initiators on hosts”. This is the new option that invokes this feature. If selected, the plugin will get the FlashArray iSCSI targets and then add them to the software iSCSI adapter (which it will create if it is not there) on each ESXi host and then set the best practices. It will do this for each ESXi host in the cluster. 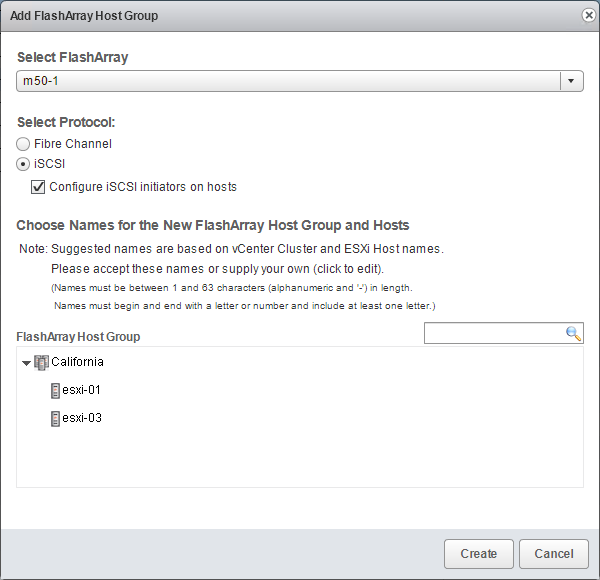 Then the plugin will create the hosts on the FlashArray for each ESXi host in the cluster and add the IQN of each respective ESXi host. Then create a host group with the specified name (defaults to cluster name) and adds the hosts to it. This process can also be invoked before or after a host group has been created. 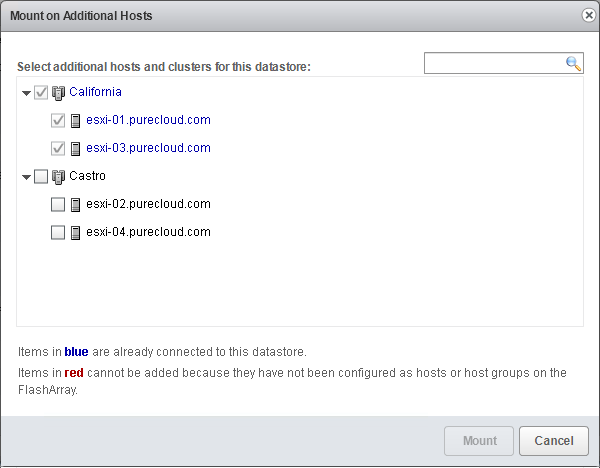 Right-click on a host or a cluster and choose Pure Storage then Configure iSCSI. A window will pop-up where you can choose one or more FlashArrays. When you click Configure, the plugin will iterate through all of the hosts in the cluster (or just the host if that is what you originally clicked on) and add the sofware iSCSI adapter if it does not exist, then adds the iSCSI targets and set best practices. It will iterate through that for each selected FlashArray. This makes setting up iSCSI super easy and fast. This is pretty straight-forward. Right-click on a FlashArray VMFS datastore and choose Mount on additional Hosts. This will then allow you to choose a new host or entire cluster (or a selection of them) for an existing datastore to be added to. If you choose a cluster which already has a host that sees it, the process will then add it to each host directly. If you choose a whole cluster and no host has the datastore yet, it will be added at the host group level. Choose the hosts or cluster you want to add it to by selecting it and click Mount. Hosts that already see the VMFS, are marked with a grayed out check. The process will then connect the volume on the FlashArray as needed and then rescan the proper hosts. This is more of an improvement than a new feature. But it is an important one for large environments. Previously, just like the standard rescan in VMware tools, hosts are rescanned in a serial fashion, so one rescan would not start until the previous host finished. This could then take a long time in large environments. So what we have changed is that we now issue rescans in parallel. So this should dramatically improve VMFS provisioning time. All plugin work flows that use rescans have been improved to use this. In Purity 5.0, we introduced support for our Active/Active replication called ActiveCluster. In provisioning we support adding a new VMFS to a pod, by entering the pod name as a prefix. In the HTML-5 version of the plugin, we intend to make pods first class citizens so this can be much cleaner. 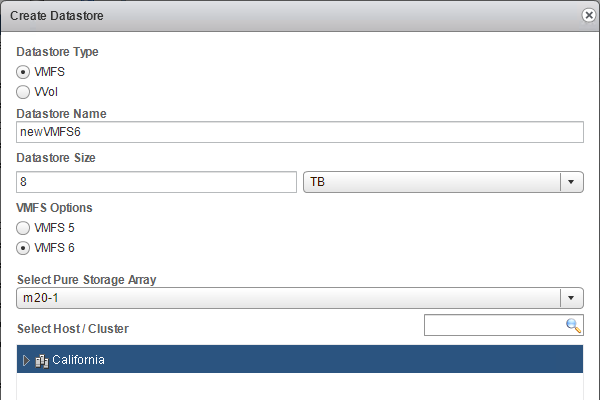 And the VMFS datastore is created and the new FlashArray volume is in the pod. To re-iterate: you cannot use VVols by just upgrading to the 3.0 plugin. You do need Purity 5.0 for these features. This is the biggest part of the plugin release and really deserves its own post, which it will get. So I will add some highlights of plugin 3.0 support for VVols. Look for a detailed post soon. Import storage policies. Takes in FlashArray protection groups and creates Storage Policy Based Management VM storage policies from them. Replication config, snapshot intervals, retentions etc. Stay tuned for a lot more on the VVol stuff! For iSCSI is there much a difference between a loginTimeout of 30 vs 60 (which is what I’ve been using)? Nah, we set it to higher than 5 to make sure controller failovers don’t cause iSCSI connection drops which 95% of them take less than a few seconds and basically 100% take under 30. So there is not a need to make it higher, but it is perfectly fine to do so. Many other vendors recommend 60, which is fine too. “This will be our last release of the plugin for the flash/flex-based vSphere Web Client. All new features and versions will be solely for the HTML-5 interface after this release. Look for HTML-5 support releases to begin in 2018.” – Does this mean 3.1 supports HTML5? I didn’t see it in the release notes. Or are we waiting on 4.0 for HTML5? 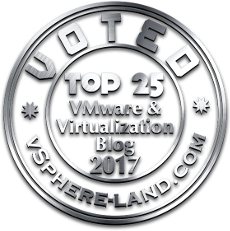 The 3.1 release of the plugin was essentially a patch version in order to support vSphere 6.7 where there were some API changes we needed to update the plugin for. We decided to increase the 3.0 to 3.1 instead of a minor release to make it easier to say “for vSphere 6.7 use plugin 3.1”. The next feature major release will be for HTML-5–it is currently being worked on and will be in beta fairly soon.